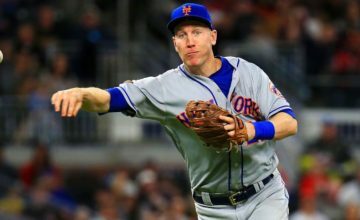 NEW YORK – March 19, 2019 – SNY, the official television home of the New York Mets, New York Jets and all things New York sports, today announced its 2019 regular season broadcast schedule for the New York Mets featuring 133 exclusive live games including pre- and post-game shows. SNY’s Emmy Award-winning Mets broadcast returns Thursday, March 28 at 1:05 p.m. 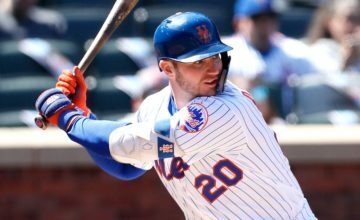 ET, as the New York Mets open the 2019 season on the road against the Washington Nationals. 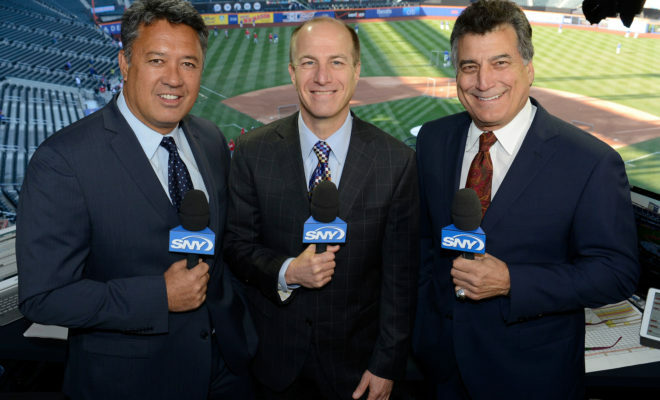 SNY’s broadcast team of Gary Cohen, Keith Hernandez and Ron Darling, widely regarded as the best booth in baseball, return for their unprecedented 14th season together. They will be joined by Mets on-field reporter Steve Gelbs. Gelbs will continue delivering his insightful in-game interviews and features with players, coaches and other personalities. This season, the broadcast team will also be providing content for SNY’s social media outlets pre-, during and post-game. 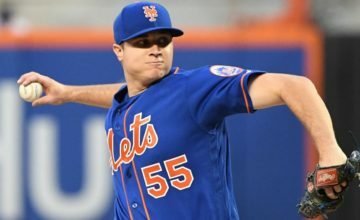 SNY’s Opening Day Lineup will begin with a special 90-minute Citi Pre-Game Live hosted by Gary Apple, who will be joined by former Mets Todd Zeile and Nelson Figueroa and former Mets General ManagerJim Duquette as they take viewers right up to the start of the game with Jacob DeGrom scheduled to take the mound for the Mets. The game will be followed by W.B. Mason Post-Game Live and will continue via SNY’s sports news and entertainment programming block starting with The Thread, Presented by Citi at 5:00 p.m. The Thread, hosted by Justine Ward, is SNY’s newest daily program and will feature insiders and social media influencers as they discuss the storylines that have the sports culture buzzing that day. Following The Thread, will be Loud Mouths, Presented by CheapO Air at 5:30 p.m., and Baseball Night in New York, Presented by Tri-State Cadillac Dealers and hosted by Doug Williams at 6:00 p.m. SNY then wraps up the entire day’s cover with GEICO SportsNite at 11:00 p.m. Throughout the season, all Mets games and pre- and post-game coverage on SNY will be streamed live via SNY.tv and the NBC Sports app to SNY subscribers. The NBC Sports app is available on Apple iOS, Android and select Samsung devices, as well as on Amazon Fire, Apple TV, Chromecast, Roku, Win10 and Xbox. Authenticated SNY subscribers can access live Mets game broadcasts, even when outside of their region, provided they are within the United States. SNY’s “TV Everywhere” streaming service is done in collaboration with the NBC Sports Group, whose corporate affiliate is a minority owner of SNY. For a full list of carriers and more information about SNY’s authenticated live streaming service, viewers can visit the following link: http://www.sny.tv/live-faq. SNY’s website, www.sny.tv, will continue to provide the most comprehensive, exclusive online coverage of the Mets anywhere on the web, while Metsblog.com will have the Mets beat covered with interviews, exclusive video features as well as the latest news and buzz surrounding the team. SNY is an Emmy Award winning, multiplatform regional sports network serving approximately eight million homes in the New York Metropolitan area and 11 million homes across the country through unparalleled coverage of the New York Mets, Jets and all things New York sports. SNY is the official television home of the New York Mets, televising more than 130 live games each season with exclusive pre- and post-game programs, plus additional Mets entertainment programming airing throughout the calendar year. As the official television home of the New York Jets, SNY delivers more than 300 hours of exclusive year-round content devoted to Gang Green. SNY is also the official television home of the UConn Huskies Men’s and Women’s basketball programs, broadcasting approximately 350 hours of UConn programming annually, including more than 20 live games. As New York’s leader in local sports television coverage, SNY delivers the most comprehensive access to all of the Tri-State area’s professional and collegiate sports teams through five nightly sports and entertainment programs from SNY’s state-of-the-art studio located high above the city at 4 World Trade Center in downtown Manhattan. SNY’s programming roster also includes classic sports programming, critically acclaimed original entertainment shows, and exclusive interview and magazine programs. Online, SNY.tv is the “go-to” digital communal home for New York sports fans to get succinct, easy-to-read updates, video highlights and features, recaps, news, opinion, rumors, insight and fan reaction on their favorite New York sports teams. Owned by Sterling Entertainment Enterprises, Charter Communications and Comcast, SNY is available to viewers throughout New York, Connecticut, New Jersey, and northeastern Pennsylvania, and nationally on DIRECTV, Verizon FiOS and AT&T U-Verse.